Yesterday I finished my first competitive marathon in 3 hours, 3 minutes and 7 seconds. I was 3 minutes and 8 seconds off my goal. I wanted to go sub 3. It didn’t happen…. My goal is still sub 3 and I will continue to push towards that goal. After taking a bit of a break from running earlier in the year, I picked back up training in June, setting my sights on the marathon. You can read about what I was doing in those few months in a previous blog. Fast forward to September and training was going well. I was improving my endurance and building the marathon fitness needed to compete. I did this routine a couple times leading into my marathon. This is a workout that supposedly gives you a prediction of where your marathon time should be. You run 10×800, with 3 minutes rest in between each one. Whatever you average for the 10 repetitions that should predict your marathon time. I averaged 2 minutes 50 seconds. That means, according to this workout, I could put together a 2 hour 50 minute marathon. Eventually…. This workout’s goal was to sustain my marathon pace each mile with no more than 90 seconds recovery in between each interval. Patience was turning into my mantra. I was able to stay between 6:38-6:47 every mile. Mission accomplished. This was a race to test my fitness. I had not raced since February, so I wanted to put on my race kit and give it a go. I ran a strong 1:25 that day (6:36 per mile). With minimal soreness the following day, I knew my fitness was moving in the right direction. Coming off the half marathon race the previous weekend, this week was my highest mileage week and I was feeling fit. This was a key workout to see how my endurance and strength tested out. I would feel strong during this workout, running nice even splits. I was even able to finish the workout with a fast 6:06 mile. I was on track. October 22nd: The following day I wanted to get up and run an “easy” 15 miles. This should be a conversation pace run, nothing hard. I stuck to the plan and ran for 2 hours and felt strong. Now it was time to start to taper to prepare for my November 5th race. I am eight days from my race and the goal is to sharpen the blade but allow my body to fully recover so I can be 100% on race day. I did this workout on the treadmill. After a good build warm up, I would run my miles in 6:40, 6:30, 6:24, 6:24, 6:19, 6:07. I felt very controlled, strong and smooth during this workout. The plan was working and I was reaching my peak. Wednesday, the 1st, four days till my marathon, I woke up to flu like symptoms. I thought “Noooo! Not on race week.” The sickness lingered through the weekend. I was couch and bed ridden for five days. I did not race on the day I was supposed to. I was a bit discouraged. Monday, the 6th, I woke up feeling a bit better. 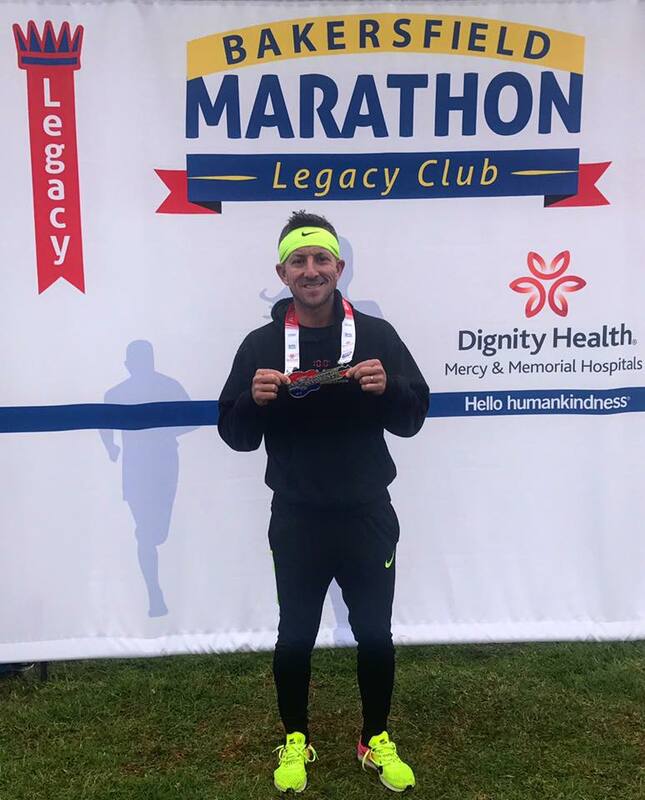 My energy was slowly coming back and I started thinking, “Maybe I could run the Bakersfield marathon this Sunday.” My whole goal was to see if I could tune my body back up to be ready to race. Tuesday, I was back to work, and completed a very moderate 7 mile run. My legs were flat but it was good to get outside and shake them out. Wednesday, I did 10 x 1 minute on the treadmill, trying to “dust off the rust” in my legs and get them moving fast again. I started feeling better. Thursday was a 10 mile progressive run that I wanted to do just to feel some miles again. It had been awhile so I needed this, probably more mentally. Thursday evening, I signed up for the race. I quickly had to get into race mode and start thinking of my race plan. Going into the race, the goal was to go sub 3. Mentally I am pretty strong, so I wasn’t allowing my focus to wane. But I am a realist and I understand the trauma my immune system went through the previous week being sick. Was I a bit more sharp and ready to race before I got sick? Of course. Was I going to let that derail my performance or make it an excuse? Absolutely not! Race morning started at 5:15 am with my usual routine of eating a banana and a bagel and I started to drink fluids. I went through a few mobility drills in the hotel room to wake up the body. I showed up to the race at 6:15 am. Race starts at 7:00 am. After a 1 mile jog warm up and some drills to get the blood flowing, I was ready to shed my sweats and head over to the race start. Since there was also a half marathon race going on, my initial goal was to stick with the 1 hour 30 minute half marathon pacer. The first seven miles went perfect, 6:47, 6:48, 6:47, 6:46, 6:50, 6:49, 6:45. I was controlled, smooth and no concerns. My mantra: Be patient. The pacer and I parted ways and I was left to fend for my own. Miles 8-12 went 6:44, 6:53, 6:52, 6:49 and 6:55. On track and still feeling strong. Miles 13-16 were tough. Those are the hills that looked easier on the course map. I wasn’t expecting such sustained climbing during these miles. I fought through them, keeping my composure. Those miles went 7:09, 7:25, 7:20 and 7:21. Here I am coming up to the 2-hour mark in the race. Holding this type of pace, this late into the run, this would be unfamiliar territory. I was able to get my legs going again after the hills. Miles 17-19 went 6:57, 6:52, and 6:51. Back on track. Mentally, at this point of the race, my mind started to wander. I felt the burning sensation in my legs. My feet were sore. My knees were hurting. I still have a 10k to go. I am still on track to go sub 3. I need to run 7:00 minute miles to hit my goal. I need to hold on for dear life. Miles 20-24 went 7:03, 7:18, 7:22, and 7:28. I am not going in the right direction. My cadence slowed, my pace dropped, my mind was in battle mode. At this point, I am reaching my physical and mental limitations. It’s hard to explain the internal warfare going on. I am literally eye-to-eye, staring at my deepest self. I wasn’t going give in and stop and walk, though my legs were screaming to do so. I was going to fight and finish this damn thing running with everything I have. Miles 25 and 26 respectively was a methodical 7:43 and 7:56. Marathon done in 3 hours 3 minutes and 7 seconds. A pace of 6:59 per mile. I need to add a few longer duration runs leading into the next marathon build up. I have the speed. But I need more endurance. I want my legs to have more stamina to withstand those last few miles of a marathon. Experience is so crucial in endurance sports (really anything you want to improve upon). This was my first marathon and I am committed to building experience in this specific distance. My training went very well leading up to this event. Getting sick put a little bit of a wrench in things but I was able to comeback and put together a good race. Remember, you can handle setbacks, you just have to keep your mindset positive and supporting your goals. There is something so ruthless and exhilarating at the same time when finishing a marathon. The endorphin rush was euphoric. The physical pain was excruciating. As I slowly and gingerly walked to my car post race, I thought about the enduring journey of the past 6 months. When going after particular goals, one must become obsessed with the process. The journey is where the magic happens. The process is where you become stronger. I put races on the calendar as “carrots” to chase after. They are not the end all be all. I love the process. I love the journey of getting fit and pushing my limits. I will continue to push my fitness and improve upon my performance. This is my life! On to the next journey….